Talk long enough to anyone in the nonprofit sector, and you are likely to find a measure of discontent; a sense that things aren’t, somehow, what we hoped they would be. I don’t actually think that this much different than what you find in the for-profit sector, just that we expect more. After all, we are doing good, aren’t we? I’m convinced it’s that—the sense that what we do changes the world in some magical way—that causes a lot of the unhappiness. If what I am doing is only to make money, then I don’t actually expect to find fulfillment in my job. But if I am there to create miracles, to make things better, to matter, then I need more than a paycheck and the occasional “good job” to get a sense of fulfillment. Not so magical after all. And the big problem is that not everyone exerts the same amount of strength or faculties in order to get stuff done. This can be mitigated in some ways by multitudes of staff. That’s not the norm, of course, at most nonprofits where we all have too many jobs we are expected to do. A secondary definition of work states that it is a “sustained physical or mental effort to overcome obstacles and achieve an objective or result.” One of the problems with too many nonprofits is that they are unclear what that objective or result is. So what? Why do I care? Why does it matter? What you do—your purpose for being—is not the same as your activities. Those are the way you accomplish what you do. So which kids do you help? Why do they need help? What happens if you are not there? Because you ARE there, what changes? And as you consider those changes, think back to why you do this work, and why it matters. And then think about how you can help to make it more fulfilling and a less like like work. Janet Levine works with nonprofits, moving them from mired to inspired and helping them to raise more money. Find out more at http://www.janetlevineconsulting.com. While there, sign up for the monthly newsletter. 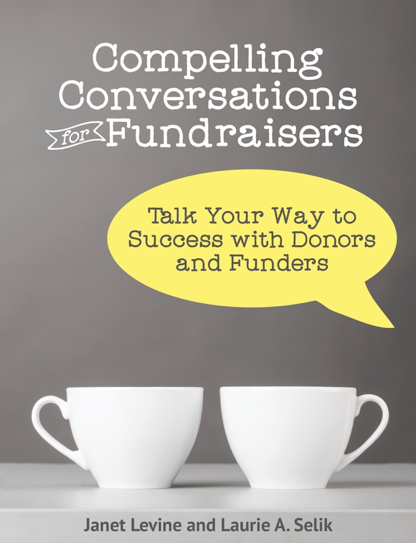 And now, buy Janet’s new book, Compelling Conversations for Fundraisers, available at Amazon. This entry was posted in nonprofits, Uncategorized and tagged doing good, purpose, work. Bookmark the permalink.